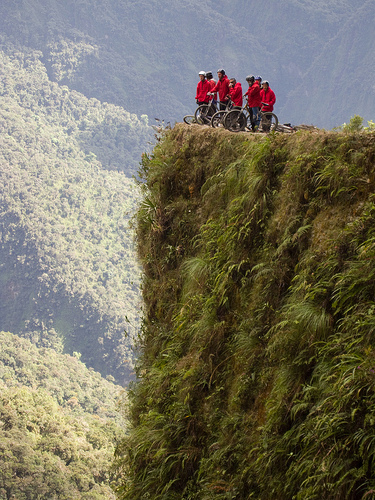 Have you ever driven on a truly dangerous road? The UK has some notorious roads and stretches of motorway but if you really want to live life on the edge then you may need to travel a little. A UK firm, Driving Experiences from Hertfordshire, is offering unique trips to some of the planet’s most terrifying roads. It costs a startling £200,000 for a short trip but for this price you get to drive a Bugatti or one of their other fleet of vehicles. Where would you choose to risk life and limb? One of the planet’s most famously trouser moistening roads is in Bolivia. This is a narrow unpaved road which twists and turns as it drops over 3,000 metres in about 35 miles. There are frankly terrifying drops of up to 600 metres at the edge and most of the way it is only just about wide enough for a single vehicle. Oh, it gets a bit muddy at times and you could bump into a rockfall or landslide as well. There is a new road covering this route so at least most of the trucks no longer pass here, but it is still popular with tourists wanting an unforgettable bike trip from La Paz. This is one of the longest highways in the world, as it covers 6,800 miles from St Petersburg to Vladivostok. Gulag prisoners made some of the worst stretches and ice, cold weather and loose surfaces are among the main hazards. You will need to be quick if you want to experience the full joy of this highway, as it is getting upgraded right now. Other options for taking your life in your hands include passing through the mountains of Pakistan on a single track road and tackling the bandits in Mexico. It seems that the planet is filled with scary roads. What is the most dangerous road you have ever travelled on? Does the Potholes Crisis Signal the End of the World? This entry was posted in News and Views and tagged dangerous roads, driving holiday, road trip by Robert Bell. Bookmark the permalink.